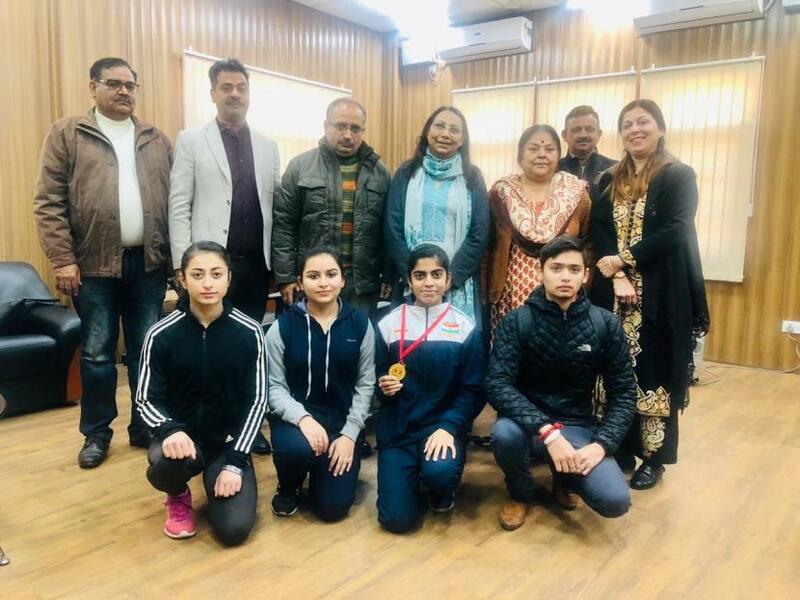 JAMMU: Ms. Riya Bakshi, Semester 2nd student of Cluster University of Jammu won gold medal in Fencing at All India Inter University Championship organised by Guru Nanak Dev University, Amritsar from 8th to 11th January, 2019. In the women tourney, Riya Bakshi, Jaspreet Kour, Sonali Choudhary and Nitika Mahajan represented Cluster University of Jammu as a team and Men's team comprised of Sourab Manhas, Ajay Sharma, Sourab Sharma and Nikhil Sharma of Constituent Colleges of Cluster University of Jammu. About 150 Universities from all over the country participated in the above mentioned tournament. Prof. Anju Bhasin, Vice Chancellor, Cluster University of Jammu applauded Riya Bakshi for her brilliant performance and assured unyielding support for promotion of sports in the future events. She appreciated both the teams for their strenuous efforts in getting laurels to the University. Prof. Poonam Dhawan, Dean Academic Affairs, Dr. Jatinder Khajuria, Registrar, Dr. Twinkle Suri, Dean Student Welfare, Dr. Sanjay Verma, Special Secretary to Vice Chancellor, Dr. Vinod Bakshi, Sports Coordinator and Sh. Satyabhushan, Private Secretary, VC Office were present at the felicitation ceremony to boost the morale and team spirit of the participants.